Bar-Bar-A has been successfully watering llamas the easy way for over 25 years. Animals learn quickly and have ready access to constant fresh water. One unit will water up to 30 head of animals. Whether a small heard or just a lone llama, Bar-Bar-A will work for you. Hot standing water in traditional automatic livestock waterers, tanks, or buckets limits water consumption. Decreased water consumption results in less production and health for your animals. The Bar-Bar-A produces fresh summertime water at a cool temperature. All this because the source water comes from underground water lines and when your llama or alpaca finishes drinking the water drains back into the ground, leaving an empty bowl. See how it works here. This means more water consumption and healthier animals. In winter, llamas also are challenged with proper hydration because of the icy, frigid standing water exposed to winter air. Because the source water for our units comes from a buried water line, the water is much warmer and easy to drink. In the winter, electrically heated water can be heated so warm that the water is not at comfortable temperature for consumption. The Bar-Bar-A is not limited by these factors. Keeping llamas properly hydrated was never easier than with the Bar-Bar-A llama waterer drinker. Animals learn quickly to push the Bar-Bar-A paddle system. For those that may need extra help the unit can be temporarily switched to training mode. Training mode makes it so that no water drains from the unit (this is a spring, summer and fall option). When the animal approaches the automatic waterer drinker they can smell and see the water and try to reach the water. Pushing their nose into the bowl to explore depresses the paddle, activates the unit, and consequently fills the bowl with water. After a few days the unit can be switched back to drain mode and the water will drain away after each drink. With this option animals learn quickly; and with no worries about providing water in the winter or cleaning algae in the summer. You free time will increase significantly. All this… and with no electricity for heating your animal’s drinking water. For wool and milk production proper hydration is a must. Water infiltrates wool fibers making them less brittle and more vibrant. Milk production is also affected for the better with proper hydration. Your animal’s overall health is connected to proper water intake. In addition, with less time chopping ice or cleaning algae your chore load will be reduced considerably; and without electricity your profit margin will increase. Llamas forage on non-grass herbs and local grasses. They can be pesky when it comes time to feeding on shrubs, trees, and will even enjoy your garden flowers and vines at your expense. Make sure your animal is not overfeeding. This can be a real problem and lead to fat llamas. Overfeeding creates lack of ambition in the animal and lessens performance in the packing season. Llamas are modified ruminants, which means the digestive system is much more efficient in the digestive process than horses, cattle, and sheep. Their stomachs differ from cows and sheep in that they have 3 chambers in their stomach rather than 4. like cattle and sheep they also chew a cud. Water is extremely important for modified ruminants. A lack of water decreases the efficiency in the 3 chambers within the stomach and can lead to ulcers and other sicknesses. 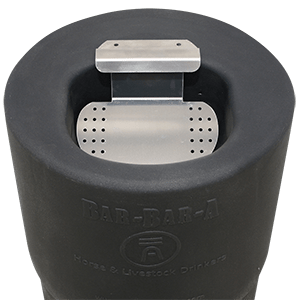 The Bar-Bar-A llama and alpaca waterer is a great tool in helping keep your animals hydrated and content. Built To Last for warm or cold climates your animals will noticed the difference and so will you. With 4 models to choose from see what unit will work for you.